3. 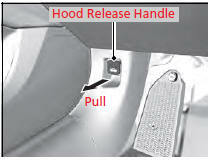 Slide the hood latch lever in the center of the hood to release the lock mechanism, and open the hood. 4. Remove the support rod from the clamp using the grip. Mount the support rod in the hood. 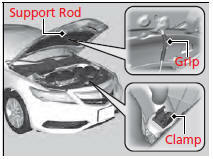 When closing, remove the support rod, and stow it in the clamp, then gently lower the hood. Remove your hand at a height of approximately 12 inches (30 cm) and let the hood close. Do not open the hood when the wiper arms are raised. 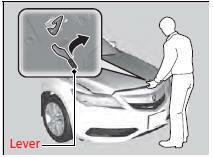 The hood will strike the wipers, and may damage either the hood or the wipers. When closing the hood, check that the hood is securely latched. If the hood latch lever moves stiffly, or if you can open the hood without lifting the lever, the latch mechanism should be cleaned and lubricated.